Happy almost Heart Day friends!! 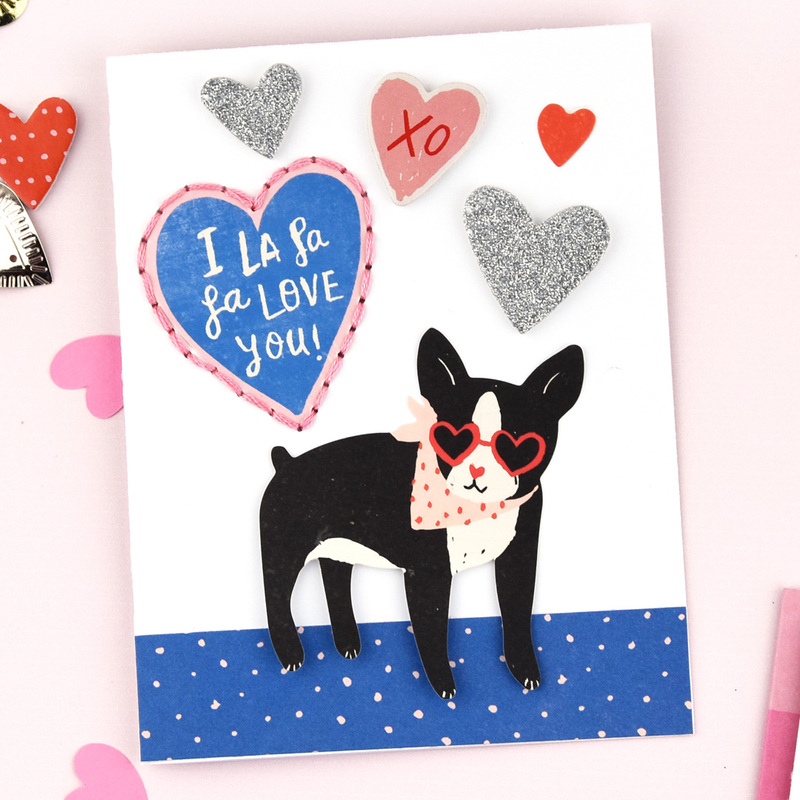 Lorilei here today sharing three Valentine cards I made with the super cute and fun La La Love Collection! 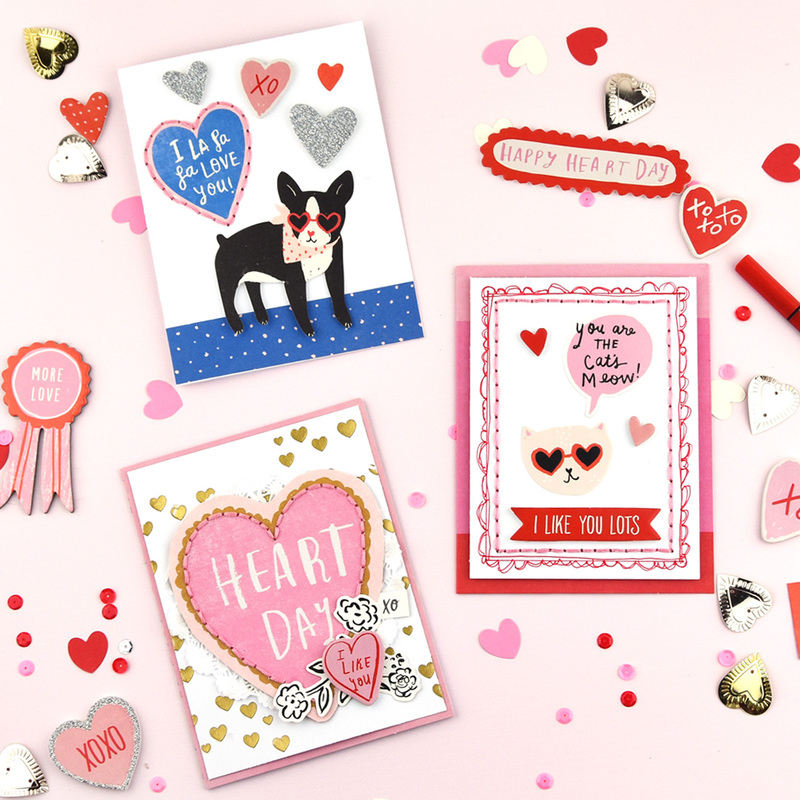 The possibilities are endless on the cute cards you could make to show how much you love someone! I just had to use the kitty with the sunglasses and the dog, way too much fun! I decided to add an extra handmade touch to all my cards, pink stitching! 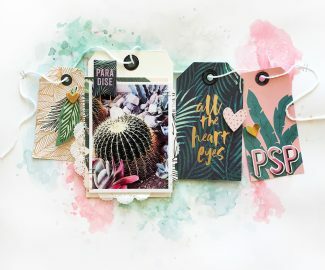 It adds a lovely texture and detail to each card. 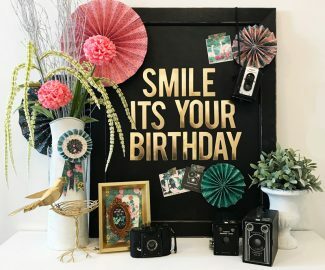 For my first card, I trimmed a piece of white cardstock to fit on top of one of the ready-made La La Love cards, having the pre-made cards make it super quick to put a card together! I drew a light rectangle with my pencil and punched holes for stitching using a thumbtack and a piece of cork beneath the paper. I added my stitching using pink embroidery floss. I thought the edge still looked a bit bare, so I used my American Crafts Doodle Pen in red to draw out a border with some sketchy scallops. I adhered the white card onto the base and then embellished! 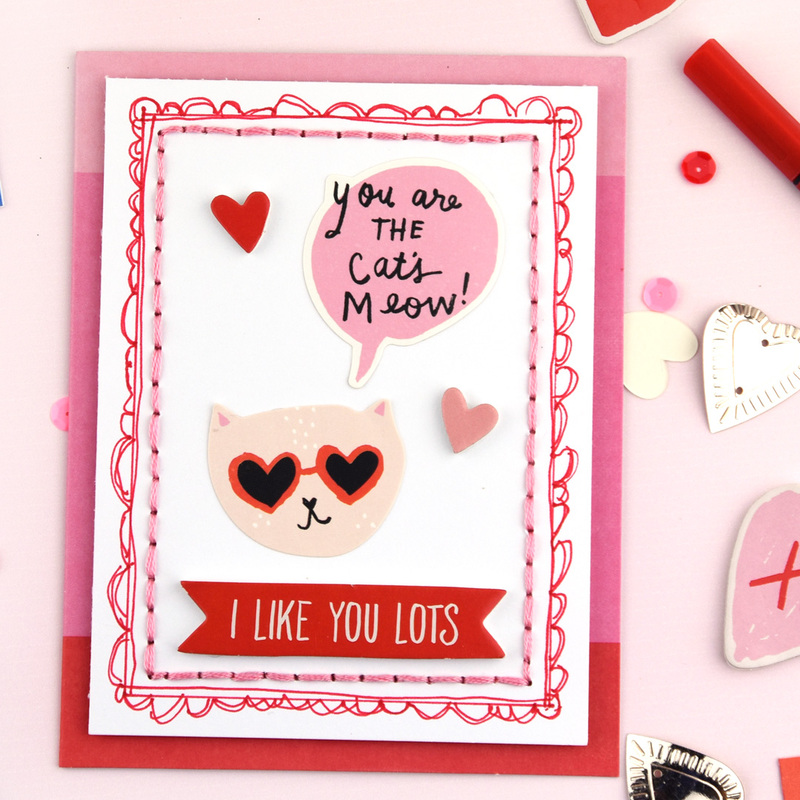 I chose the kitty for this card and had to add the cat’s meow speech bubble. To ground the design, I added a foam Thickers banner under the kitty and then sprinkled some foam hearts above! 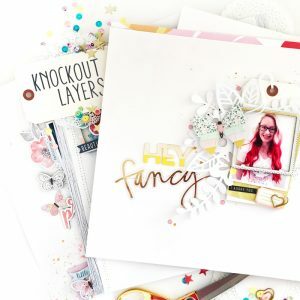 I love how this card turned out, and it has the perfect sentiments to give to a friend! 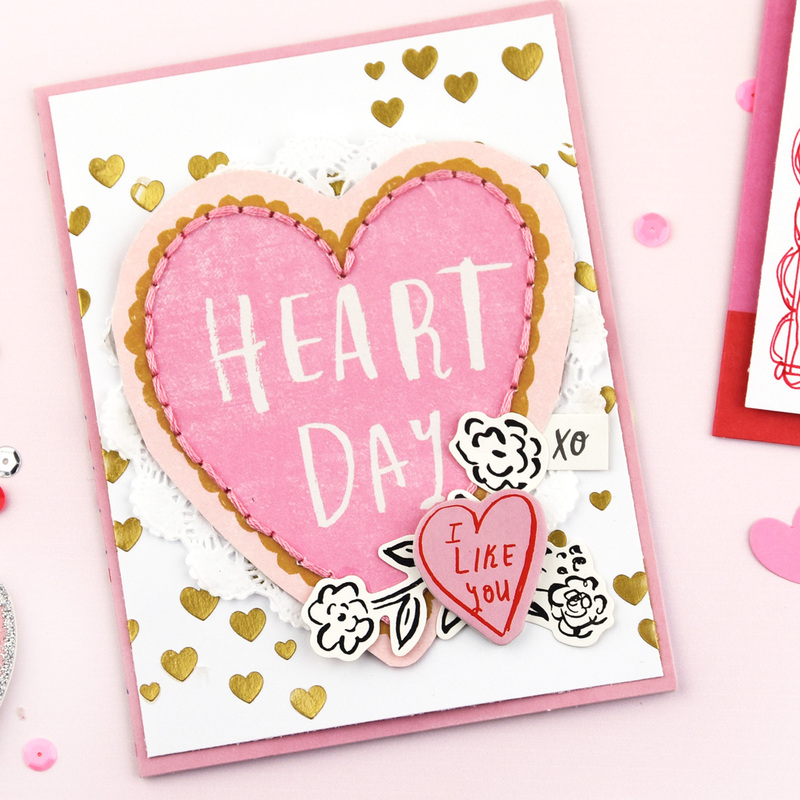 My next card uses a big heart from the Like You paper. I fussy cut it from the square cut apart and punched stitching holes, then stitched in the same pink floss. For the background, I added some Heidi Swapp gold texture paste through a stencil and let that dry. 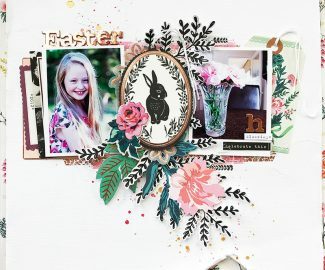 I selected another pre-made card with a pretty pink edge. Once the background was dry, I added some foam to the back of the heart and added it to the card. I used the super sweet floral stickers and a foam heart for a little cluster at the bottom of the heart! For my last card, I wanted to feature the super cool dog! Those sunglasses and bandana are way to fun! I fiddled around for quite a while with this card to get a design I liked. I finally figured out that the dog was “floating” all over the card and I needed to add something to ground her. 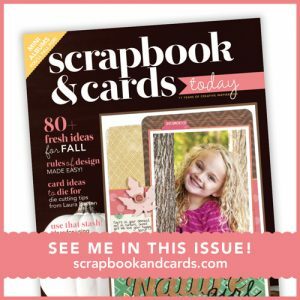 I cut a strip of the rich blue paper for the “floor,” and it made all the difference! The blue makes the pinks pop so I decided to add a blue heart sentiment from the sticker sheet and stitch around it. More foam and sticker hearts finished off the top of the card perfectly! Thank you for joining me today! 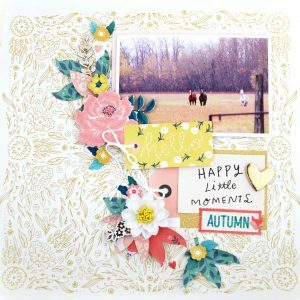 I encourage you to try adding stitching to your cards or other projects, it adds such a delightful detail!